As is generally known, the use of flat sealing washers from soft or non-ferrous metals for pressure gauges, valves and other fittings is often problematic.The screwed connections must betight, and at the same time, the parts being connected must be in the desired orientationwith respect to each other. Either the pressure gauge is not in the required readable position or the valve is not in the desired operating position, or in the ideal position there is no sealing. 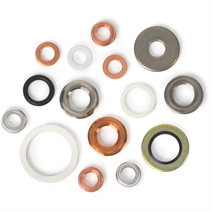 Consequently, it becomes necessary to unscrew and replace flat sealing washers by washers with different thicknesses several times, until the desired sealing quality is achieved. With the WIKA sealing ring it is possible to orientate the pressure gauge to the desired position by turning up to a full turn after sealing has been made. Due to its slightly different form and the higher strength of its material, the WIKA stainless steel sealing ring enables an excellent sealing quality after only a slight turn, but in this material only approx. a further ½ turn is possible for orientation. For self-centering on the centering spigot in accordance with EN837-1. For centering in the bore hole, intended for pressure gauge connectors not featuring a spigot or sealing shoulder.